I like to be organized and save money. 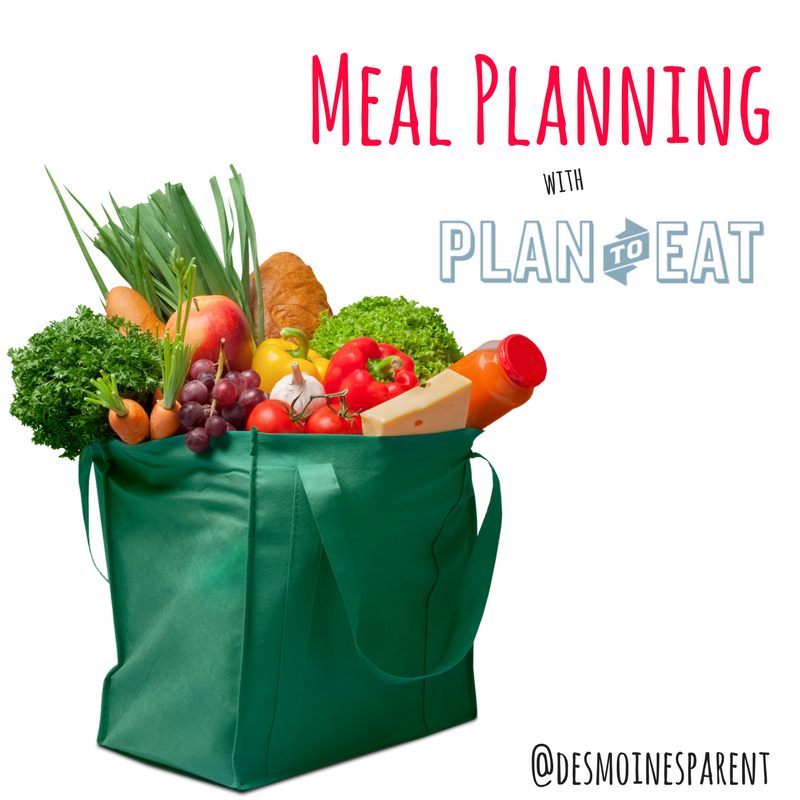 When it comes to groceries and meal planning, it is always a headache. I seem to create a system, but then don’t follow through. Our lives change constantly. My husband works a weird schedule and is home maybe 2-3 nights a week, kids have activities, birthdays, and so on. This year was our family’s first year of having a child in school all day, so I knew we needed to get some consistency again. I came across Plan to Eat. 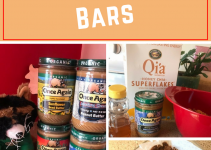 I was little leery of the idea paying for a program to organize my recipes and condense my lists, but after my free trial I knew it was a must! Plan: Drop + drag calendar. Plan a week or an entire month at once! Shop: Print your list or download the free app and shop with your grocery list on your mobile device. The cook tab is where you save and store all your favorite recipes. You can add friends who also have Plan to Eat so you can share recipes. 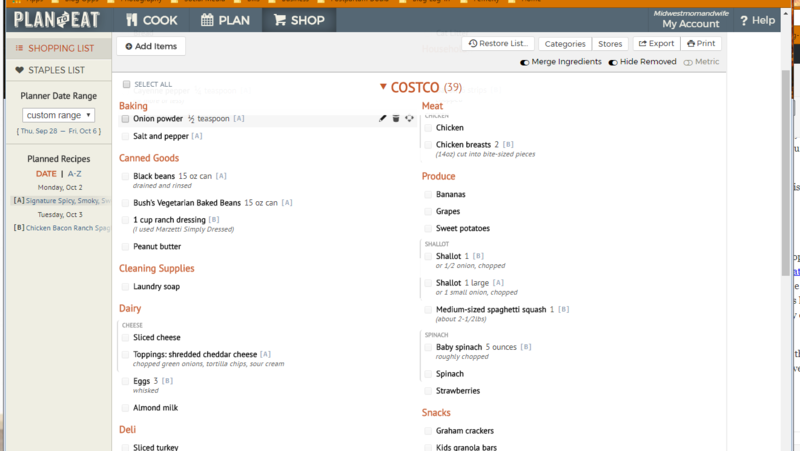 You can also sort by course, total time, main ingredient or pick out specific ingredients. Searching for specific ingredients has become super useful with saving money and not wasting food. 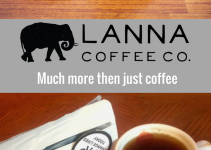 Each week, I take note of what we have and filter out my recipes that way. When I started with NO recipes in my “box”, I was little hesitant. 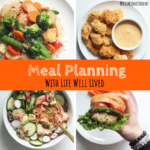 I was quickly able to transfer my favorite recipes I had pinned on Pinterest, by just copying and pasting the link into Plan to Eat. It transferred and organized everything very quickly. 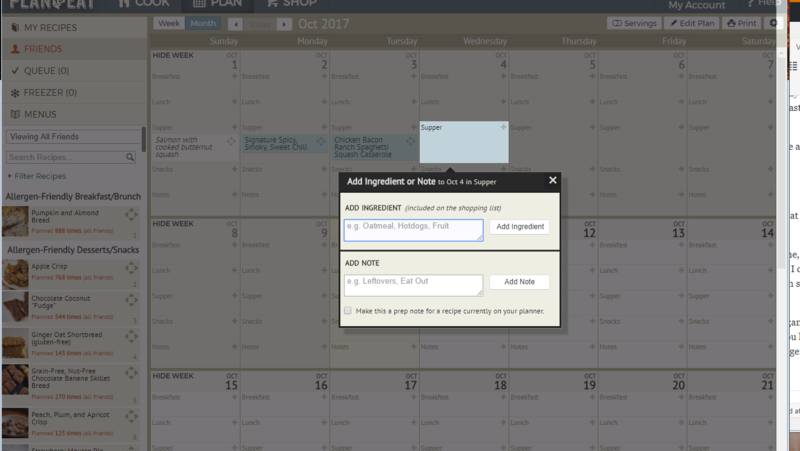 I only mess around with this tab about monthly or if I know I want to include a specific recipe on my meal plan. I plan weekly. Some people like to plan monthly and you can definitely do that with this program. Each week I look at our family calendar to figure out when we will all be home, or when we are planning to eat out. If I know we have a busy night, I will find a recipe for a casserole and prep it on Sunday. Seriously, Plan to Eat has taken so much stress off my life. You can easily drag and drop your recipes into the dates. 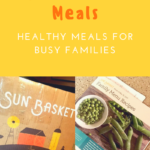 You can further organize it by choosing a recipe for breakfast, lunch and dinner for each day too. If you know one night you are going to have leftovers or you are going to just throw some burgers on the grill, you can just type that right in the little slot. You can add it as a “note” or as an “ingredient”if you want to make sure it is included on your shopping list. Now the fun part! Shopping. The shop tab is broken down into two lists: shopping list and staples list. When I opened my account I created my staples list. We shop at Costco monthly and we usually by the same thing monthly. 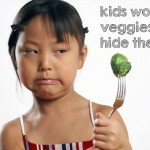 We also buy some of the same produce weekly at either Fresh Thyme or Hy-Vee. 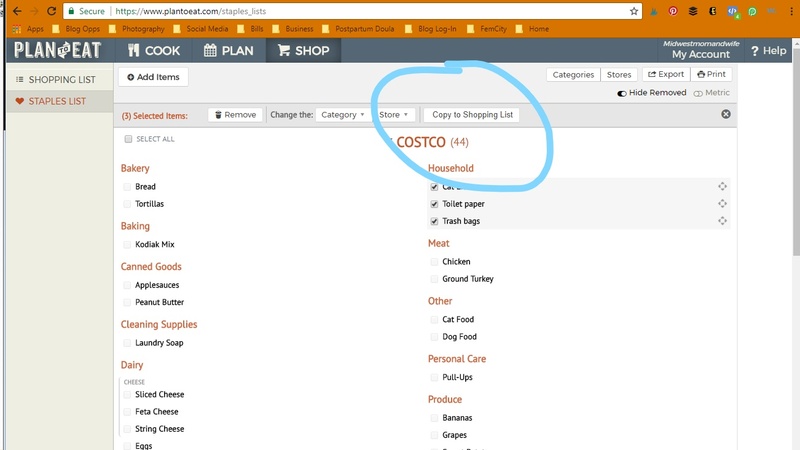 You can create a staples list for each store you shop at. Make sure you add things like toilet paper, laundry detergent, etc. I start with my staples list and select anything I know we may need to buy this week. Once I have selected those items I select “copy to shopping list” and it conveniently adds all these items to my shopping list. 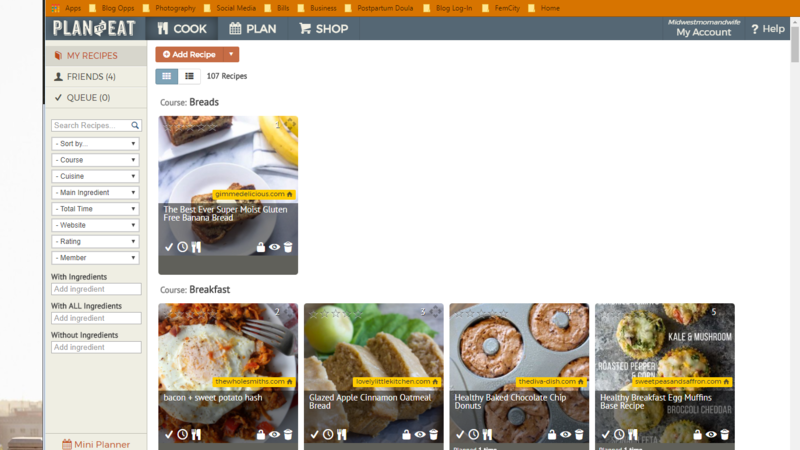 I then select my shopping list and this is where the program has gone through all my recipes for the week (you can select a custom date range) and condenses all the ingredients for me. It also further breaks it down into categories such as baking, canned goods, produce, dairy, etc. At this point I usually print my list, then head to the kitchen to cross off whatever I may already have. I also print off all the recipes I will be using and clip them to my fridge for easy access when it is time to cook. 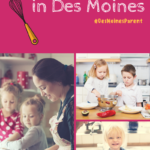 You could also take it up a notch and order your groceries online (Hy-Vee or Walmart) and really get it all done at once! I highly recommend starting with the Plan to Eat free trial. I know not every planning process if for every family, but it give it a try!